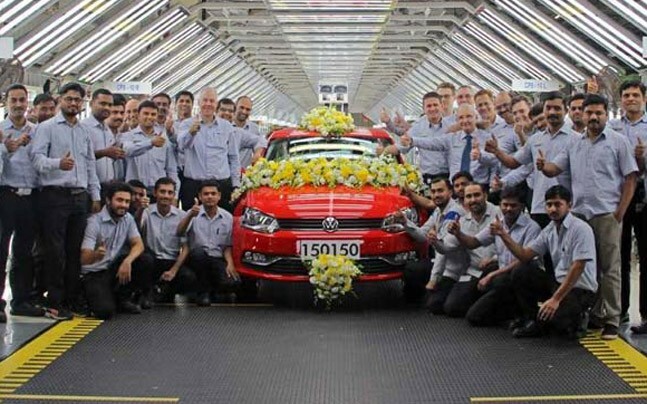 Volkswagen Polo and Vento stood at over 93,100 cars. 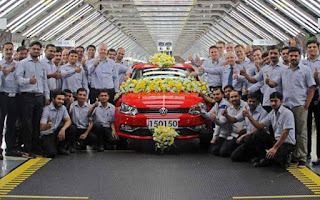 PUNE (NEW DELHI): Volkswagen India's Pune manufacturing facility has recorded its highest ever annual production since 2009. The plant produced 1,50,150 cars in 2017 and this has been possible because of a combination of higher demand originating from domestic as well as export markets. VW's Pune facility manufactures a range of vehicles which includes the VW Polo, Ameo, Vento and Skoda Rapid. Also, in addition to the cars, the 1.5-litre and 2.0-litre diesel engines are also being assembled at the same facility. The production for domestic sales volume for the year 2017 reached over 57,000 units from the Pune Plant for Volkswagen and Skoda together. The production of export units which includes Volkswagen Polo and Vento stood at over 93,100 cars. Over all, the total number of cars rolled out of the plant has crossed 870,000 units. Dr. Andreas Lauermann, President and Managing Director, Volkswagen India Private Limited said, "Volkswagen India has once again registered positive growth - thanks to our customers from India as well as around the world, who have trusted in us and who have invested in our products. We believe in delivering top quality cars that are engineered to the customers' expectations." He further added, "Volkswagen is committed to India. We believe in the potential of this market and we are setting ourselves up as a serious competitor for the future."